James Hong (traditional Chinese: 吳漢章; simplified Chinese: 吴汉章; pinyin: Wú Hànzhāng; Jyutping: Ng4 Hon3zoeng1; born February 22, 1929) is an American actor, voice actor, producer, and director of Chinese descent. He has worked in numerous productions in American media since the 1950s, playing a variety of East Asian roles. He became known to audiences through starring in the crime series The New Adventures of Charlie Chan (1957–1958). Hong is known for his roles in various Hollywood films, such as Chinatown (1974), Airplane! (1980), Hannibal Chew in Blade Runner (1982), David Lo Pan in Big Trouble in Little China (1986), Jeff Wong in Wayne's World 2 (1993), Master Hong in Balls of Fury (2007), and R.I.P.D. (2013). Hong also famously guest starred on the sitcom Seinfeld as a maître d' in the episode "The Chinese Restaurant". As a voice actor, Hong voiced Chi-Fu in Mulan (1998), Daolon Wong on the television series Jackie Chan Adventures (2002–2004) and Mr. Ping in the Kung Fu Panda franchise, in addition to several video games roles including Sleeping Dogs and Call of Duty: Black Ops II (both 2012). Hong also voiced several characters in Avatar: The Last Airbender. Hong is a charter member and former president of the Association of Asian/Pacific American Artists (AAPAA). Hong was born in Minneapolis, Minnesota to Frank W. Hong and Lee Shui Fa. His father (Chinese name: Ng Fok Hong) emigrated from Hong Kong to Chicago, Illinois via Canada, where he owned a restaurant. Hong's grandfather was from Taishan. For his early education, Hong moved to Hong Kong, where he lived in Kowloon, before returning to the United States at the age of ten. He graduated from Minneapolis Central High School. He studied civil engineering at the University of Minnesota, where he concentrated the majority of his free time on moving plates and fixing templates for the drill squad. James later became interested in acting and trained with Jeff Corey. Hong was a road engineer in Los Angeles County for seven and a half years, acting during his vacations and sick days. He eventually quit engineering for good to devote himself to acting and voice work full-time. Hong has played over 400 television and film roles. His career in show business began in the 1950s when he redubbed soundtracks of several Asian films. He dubbed the voices of characters Ogata (Akira Takarada) and Dr. Serizawa (Akihiko Hirata) in the 1956 Godzilla, King of the Monsters!, as well as the title character in The Human Vapor. In 1956, he was cast as Jimmy Ling in the episode "Red Tentacles" of the Western aviation adventure series Sky King, starring Kirby Grant. He guest-starred in the NBC Western series The Californians. In 1957-1958, he was cast as the "Number One Son", Barry Chan, in the British-American series The New Adventures of Charlie Chan starring J. Carrol Naish as Charlie Chan. The role of the Number One Son was played by Keye Luke in the predecessor films. However, Keye Luke's character was known as Lee Chan. In 1962, he appeared on CBS's Perry Mason as Dean Chang in "The Case of the Weary Watchdog", and in 1963, he played Louis Kew in "The Case of the Floating Stones". He also appeared three times on the NBC military sitcom, Ensign O'Toole. In 1965, Hong was one of the original founding members of the East West Players, an early Asian American theatre organization. Also in 1966, he played the bar owner Mr. Shu in The Sand Pebbles. Hong also appeared in several episodes of the original Hawaii Five-O. Hong had a small part on a 1972 episode of CBS's The Bob Newhart Show. He was a frequent guest star on the 1972–1975 ABC television series Kung Fu, joined the cast on the final season of CBS's Switch, as Wang, and also played a flight attendant in the original 1979 film The In-Laws. He appeared as a doctor accused of performing an illegal abortion in the Blake Edwards movie The Carey Treatment in 1972. He starred as a uniformed man in the 1980 comedy cult film Airplane! He has also directed such films as Teen Lust. Hong is perhaps most widely known as the immortal ghost sorcerer Lo Pan in John Carpenter's cult classic Big Trouble in Little China (1986), as the eye manufacturer Chew in Blade Runner, as Evelyn Mulwray's loyal and vigilant butler in Chinatown and The Two Jakes, and as the low-rent private eye in Black Widow. He would then appear in the film The Vineyard (1989). Hong's first appearance as a host in a Chinese restaurant was in the movie Flower Drum Song. Hong then appeared as a host in a Chinese restaurant in the 1975 All In the Family episode "Edith Breaks Out" as well as on the well-known Seinfeld episode "The Chinese Restaurant". Hong also played a similar role in several episodes of The Big Bang Theory during its first season, as well as in the "Color Blind" episode during the first season of Alias. Hong portrayed Chow Ting, a dry cleaner with the power to wash sins and guilt from a person's conscience in the 1985 Tales from the Darkside episode "It All Comes Out in the Wash". Hong appeared as a villain in a season three episode of The X-Files. He appeared in two episodes of The West Wing (Ep. 1.11; 3.15) as the Chinese Ambassador to the United States. He also played Mr. Soo on The King of Queens, an Asian restaurant owner again who rents Doug Heffernan and his friends a loft apartment above his store, in the episode "Apartment Complex" (2006). Additionally, Hong had guest-starred on Friends, playing Hoshi, the former paid assassin and boxing coach for Monica's boyfriend Pete (played by Jon Favreau) in the episode "The One with the Ultimate Fighting Champion". Hong played Jeff Wong, Cassandra Wong's martial arts expert father in the comedy sequel Wayne's World 2 (1993). In 1994, he, his wife Susan and daughter April appeared as a family riding mountain bikes beneath the Hollywood sign in the mountain-bike travel-adventure documentary, Full Cycle: A World Odyssey. He had a small role in the independent film Broken Vessels (1998). He played the role of Mr. Takato in the movie Chasing Zoey, the final episode of Zoey 101. His character taught Michael Barret how to operate a manual transmission, and it was revealed at the end of the episode that he did not exist. Hong also voiced the character Daolon Wong, an evil wizard in the Jackie Chan Adventures television series, and was the voice of Chi Fu in Disney's Mulan, A.N.T. Farm, Mandarin in Super Robot Monkey Team Hyperforce Go!, and Professor Chang in Teen Titans. He made a cameo appearance on the television series Las Vegas as a presumed cheating monk. 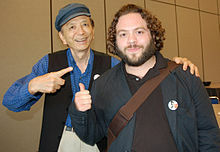 James Hong also lent his voice to the Cartoon Network animation Chowder as Mung Daal's mentor in the "Won-Ton Bombs" episode. In 2006, Hong voiced the character Mayor Tong in Avatar: The Last Airbender in the second season's episode titled "Avatar Day" in addition to his previous role as Monk Tashi in the first-season episode "The Storm" in 2005. In 2006, he also voiced the character of the High Lama in the film Chill Out, Scooby-Doo! Hong's voice also appeared as Colonel Zhou Peng in the video game Mercenaries: Playground of Destruction, Dr. Chang in Def Jam Icon (2007), Ancient Wu in True Crime: Streets of LA, and reprising his role as Chew in the Blade Runner video game. His most recent appearances were in the films Balls of Fury and The Day the Earth Stood Still. In 2008, he voiced Mr. Ping in Kung Fu Panda, the adopted father of Po and was nominated for an Annie Award for his performance; he later reprised the role on Kung Fu Panda Holiday Special and won an Annie Award for Voice Acting in a Television Production. Furthermore, he and Lucy Liu have been collaborated in the feature film series and in the television series adaptation, Kung Fu Panda: Legends of Awesomeness. After the release of the third film he stated that he hoped to continue in the role, though due to his advanced age the filmmakers should start work on it quickly. In 2015, Hong voiced Azmorigan on Star Wars Rebels as well as the Sugi arms dealer Endente in an unfinished four-part story arc of Star Wars: The Clone Wars; the rough animatics for the entire arc have been published on the official Star Wars website. He appeared in the film Safe (2012). He also provides the voices for the jeweler NPC Covetous Shen in Diablo III, Master Bruised Paw in World of Warcraft: Mists of Pandaria, Bucky (for two episodes) from the television series Archer, and Uncle Po in Sleeping Dogs. In 2013, he appeared as Ogisan, the gift shop keeper from the Incredible Crew sketch "Magical Video Game Controller" alongside Jeremy Shada and Shauna Case. He also appeared in the film R.I.P.D. (2013). Hong guest-starred in a 2015 episode of Agents of S.H.I.E.L.D. as the father of Melinda May, played by Ming-Na Wen, with whom he co-starred in Mulan. Hong lives in Los Angeles, California, with his wife Susan (née Tong) whom he married in 1977. They have a daughter, April. Hong is a Presbyterian Christian, and he has attended the Westminister Presbyterian church with his family as a child in Minneapolis. ^ a b Leung, Albert (November 4, 2009). "Home from Hollywood: James Hong's nostalgic return to Minnesota". China Insight. Retrieved October 2, 2016.